Whether we like it or not, each of us (our kids included) have our very own digital footprint. This footprint or profile is a collection of what we’ve done and how we’ve portrayed ourselves in the online world. And they matter more than ever in today’s digital age. Our kids’ digital profiles affect how they are perceived by everyone from college admission reps to their future employers. 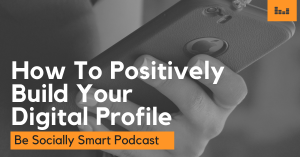 In today’s episode, Caleb will discuss the importance of establishing a positive digital footprint. He’ll also share some helpful pointers for parents and teens, including why starting early is the key. Don’t miss this important episode, and we’d suggest having your kids listen in as well!